Signs of weakness in Western Europe and Asia, combined with ever-tighter resource utilisation and rising American interest rates, have increased the downside risks to the world economy. SEB is adjusting its GDP growth outlook slightly lower, but the global economy will continue to grow somewhat above trend in 2019 and 2020. This will provide support for corporate earnings and share prices, although we will have to become accustomed to heightened volatility. Labour markets will continue to strengthen, and accelerating pay increases will challenge any notion of the death of inflation. But although inflation risks have risen, central banks still have room to move forward with cautious key interest rate hikes. Despite stimulus from a weak krona, record-low interest rates and fiscal policy, the Swedish economy is not gaining real momentum. However, a strong labour market contrasts with slower growth due to falling residential construction, cautious households and an export sector that is already operating at full speed. SEB expects GDP growth in Sweden to end up just above 2 per cent for the entire 2018-2020 period. Despite the risk of new inflation disappointments, the Riksbank will begin hiking key interest rates, probably as early as December, followed by two hikes per year during 2019 and 2020. The krona will gradually appreciate from 10.15 per euro at the end of this year to 9.70 by the end of 2020. The global economic growth picture has recently become more divergent, with continued evidence of strength in the United States, but signs of weakness in emerging market (EM) countries and Western Europe. American GDP growth will slow from more than 3 per cent in 2018 to about 2.5 per cent in 2019 and less than 2 per cent in 2020. In the euro zone, growth appears to have peaked last year, but it will remain at around 2 per cent during 2018-2020. SEB is lowering its global economic outlook by 2-3 tenths of a percentage point annually and predicts that world GDP will now grow by 3.8 per cent in 2018, followed by a slowdown to 3.6 per cent yearly in 2019-2020. Despite downward revisions, this forecast implies that the global economy will continue to show above-trend growth in 2019-2020. Overall unemployment in the 36 member countries of the mainly affluent Organisation for Economic Cooperation and Development (OECD) - today already at its lowest in nearly four decades - may thus fall by another half percentage point. Resource limitations will then be a larger focus of attention, and more countries are now approaching a point where recruitment difficulties are seriously beginning to slow economic expansion. Signs that pay increases are accelerating show that it is premature to announce the death of the "Phillips correlation" between unemployment and inflation. In the four largest OECD economies (the US, the euro zone, Japan and the United Kingdom), wage and salary hikes have speeded up from 1.7 per cent to 2.6 per cent in the space of just over a year. The inflation outlook is more uncertain today. Core inflation has remained at around 1.5 per cent in most countries, suggesting that headline (CPI) inflation will fall as the impact of higher energy prices fades. But rising cost pressure due to slow productivity growth, the potential to pass on costs to consumers in an overheated economy and decreased globalisation are reasons why inflation may not fall. SEB's main scenario, however, is that inflation will not climb in a way that will force central banks to step up the pace of monetary tightening. SEB is sticking to its forecast of four additional US rate hikes to 3.25 per cent by the end of 2020. In Western Europe, central banks will adhere to their plans for a very gradual normalisation of monetary policy. The European Central Bank (ECB) will raise its key interest rate to 0.75 per cent by the end of 2020, and the spread between long-term US and German government bond yields appears likely to remain historically wide. At least in the medium term, it looks as if the European yield cycle - in the Japanese manner - has decoupled from US yields. Western Europe will thus have little room to respond to the next recession by lowering key interest rates, but the opposite is true in fiscal policy: the euro zone as a whole is generally close to budgetary balance, whereas President Donald Trump's tax cuts are increasing public sector deficits despite the ongoing US economic boom. Apart from resource restrictions, the global expansion is challenged by downside risks from the Brexit process (UK withdrawal from the European Union), Italy's budget policy, an escalating trade war, worries about a Chinese hard landing and crises in individual EM countries. Concerns about falling corporate earnings and rising US yields amid a mature economic boom are sources of stock market turbulence. 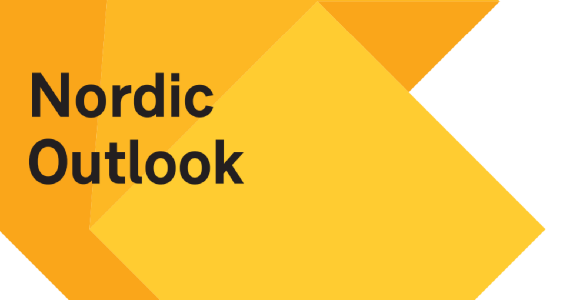 In a number of theme articles in the November issue of Nordic Outlook, SEB examines the risks from the EM sphere, trade policies and stock markets, mainly arriving at reassuring conclusions. There is a relatively low probability that the EM countries will trigger a global economic crisis in the near future. The trade war is still manageable in terms of growth and is also accompanied by certain trade policy successes. Share prices are being supported by healthy underlying economic growth and reasonable valuations. Late in the economic cycle, however, there is a mounting risk of negative feedback loops between the economy and financial markets. Meanwhile it is difficult to find reliable leading financial indicators. The Nordic economies are affected by the euro zone slump but are growing at a healthy pace despite some downward revisions in forecasts, especially for 2018. Norwegian industry is defying trends, stimulated by an oil sector upswing. The mainland economy (excluding oil, gas and shipping) will grow by about 2.5 per cent this year and next, followed by just over 2 per cent during 2020. Residential construction in Norway looks set to rebound after an earlier sharp downturn, while strong fundamentals will help sustain private consumption. Norges Bank will raise its key rate cautiously, taking into account interest rate-sensitive households. Temporary effects will contribute to a slowdown in the Danish economy this year. Growth will average around 2 per cent during 2018-2020, sustained by stable growth in jobs and pay levels as well as moderate home price increases. Business sentiment indicators in Denmark have fallen, in line with euro zone counterparts, but have rebounded in recent months. Despite international turbulence, the Finnish economy is growing above trend. Economic performance will become more balanced, with greater support from consumption in addition to the earlier growth drivers: exports and capital spending. Finland's GDP will increase by 2.7 per cent this year and by more than 2 per cent yearly in 2019-2020. The Baltic economies remain in the top ranks of the euro zone in terms of growth. Since they are highly export-dependent, their expansion will decelerate as international demand slows, but domestic demand will keep yearly GDP growth at around 3-3.5 per cent in all three countries. Despite a weak krona, record-low interest rates and fiscal stimulus, the Swedish economy is not gaining real momentum. Falling home construction is pulling down growth. Cautious households - worried about housing market risks and future shortcomings in the social welfare system - are also slowing the expansion dynamic. Another reason may be that the export sector lacks enough capacity to take advantage of its favourable competitive situation. But special methods for measuring public sector productivity may also be leading to underestimates of growth. SEB has lowered its GDP growth forecast after a downward revision of official second quarter figures. The economy is now expected to grow by a bit more than 2 per cent yearly during 2018-2020: somewhat above trend. But the picture is not consistent: the GDP deceleration contrasts with a strong labour market, as well as good corporate earnings performance. As elsewhere in Europe, the manufacturing slump in Sweden is expected to be temporary. Combined with historically high capacity utilisation, this will support a faster upturn in business investments. Improved trade in the service sector is expected to help speed up export growth. In Sweden, as elsewhere, resource restrictions and changing inflation drivers have attracted greater attention. Unemployment has surprised on the upside, but this increase is primarily driven by an increased labour supply. SEB's forecast is that unemployment will resume its previous downward trend. Despite the large labour shortages cited in the Economic Tendency Survey published by the National Institute of Economic Research (NIER) and other sources, pay increases have remained low. Although wages and salaries may climb somewhat, in line with other countries, no acceleration is likely to occur until after the next national wage round in the spring of 2020. The inflation upturn has instead been driven by temporary forces, mainly energy prices and recently the weak krona plus - to some extent - rising food prices. When these effects fade, CPIF inflation (CPI excluding interest rate changes) is expected to drop below the Riksbank's 2 per cent target during the latter part of 2019, before higher pay and international prices cause it to climb again. In December, the Riksbank will probably deliver the rate hike it has announced, but due to the risk of new inflation disappointments, a delay until February 2019 cannot be entirely ruled out. During 2019 and 2020, the repo rate will be raised twice a year, reaching 0.75 per cent by the end of 2020. The government bond yield spread vs Germany will widen as the Riksbank hikes its key rate ahead of the ECB. Interest rate policy will remain the most important driver of the krona. The EUR/SEK exchange rate is expected to reach 10.15 by year-end, followed by a gradual krona appreciation to 9.70 by the end of 2020. Because of Sweden's current difficulties in forming a new government after the September 9 election, fiscal policy for 2019 in particular may turn out to be less expansionary than previously expected. Yet this situation poses no threat to financial markets, given strong central government finances and other factors. A theme article in this Nordic Outlook discusses how low Swedish equilibrium unemployment can fall. SEB's conclusion is that the assessments now being made by the Finance Ministry and NIER are too pessimistic, which may ultimately result in unnecessarily tight fiscal policy. SEB is a leading Nordic financial services group with a strong belief that entrepreneurial minds and innovative companies are key in creating a better world. SEB takes a long term perspective and supports its customers in good times and bad. In Sweden and the Baltic countries, SEB offers financial advice and a wide range of financial services. In Denmark, Finland, Norway, Germany and the United Kingdom, the bank's operations have a strong focus on corporate and investment banking based on a full-service offering to corporate and institutional clients. The international nature of SEB's business is reflected in its presence in some 20 countries worldwide. On September 30, 2018, the Group's total assets amounted to SEK 2,777 billion while its assets under management totalled SEK 1,871 billion. The Group has around 15,000 employees. Read more about SEB at https://www.sebgroup.com.